As much as I advocate being a Sensible Consumer when it comes to games, I will admit that there is a certain thrill to anticipating a new game for months, buying it on day one, taking it home, ripping into the shrinkwrap and telling your adult obligations to beat it for the rest of the day. For me, this goes all the way back to “Sonic 2sday”, which was the first time I’d preordered any game – really, the first time I’d been introduced to the idea that you COULD preorder a game – and I have fond memories of clocking out from my $9/hour tech support job for lunch, making the 45 minute round-trip walk to the local mall to buy my copy, and marking time / compulsively reading & re-reading the manual for the rest of the day until I could take it home. Sure, there is the occasional crushing disappointment when you actually dig in to your new purchase – the less said about “Homefront”, the better – but at least you get the buildup and the HYPE HYPE HYPE. 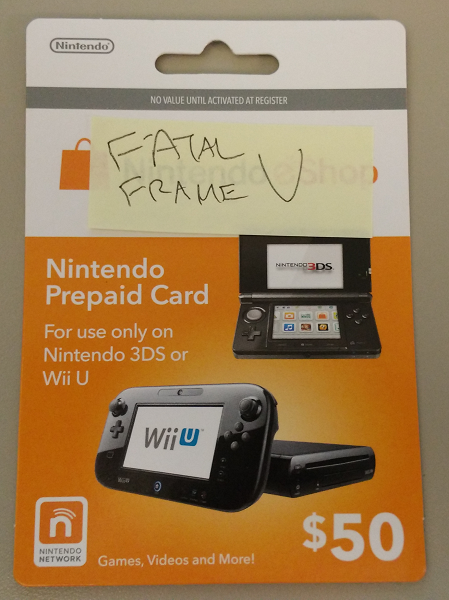 With “Fatal Frame V”, Nintendo has tried very hard to front-load the crushing disappointment. We’re getting a digital-only release, and one that takes well over half of the WiiU’s pitifully-small internal storage, they’ve altered cutscenes for content – in an M-rated horror game – and they’ve replaced some of the original bonus costumes with bizarrely out-of-place Zelda and Metroid outfits. Nonetheless, I will not allow them to deprive me of my deserved HYPE on this, the day of release, and I have constructed a small prop to assist me in maintaining appropriate HYPE levels until such time as I can rush home after work and, uh, I guess, punch in a code and press the “Download Now” buton. I should have brought in a blank DVD case, though. I could have printed out a custom insert for it, even.